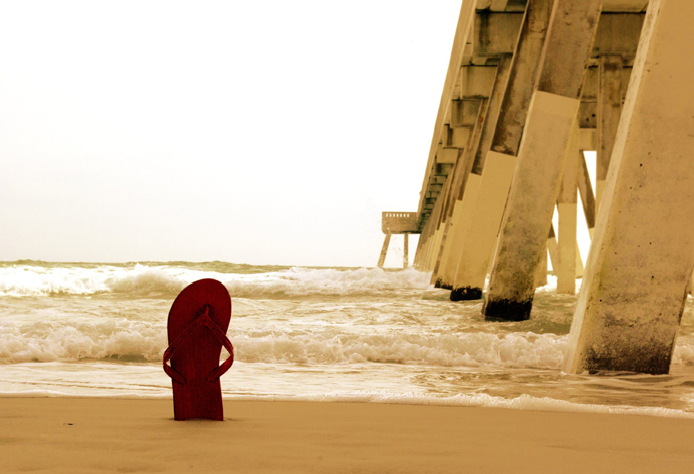 Although actually taken in February (in North Carolina), this photo presents a typical end of summer shot. The winter light and muted colors imply a transition from summer to autumn and so from leisure to work. The lone sandal probably was lost as someone was playing in the waves and then washed up later. Someone else probably stuck it in the sand to help it be found again.I’d like to think that the motive was not so pragmatic. Perhaps someone saw the sandal and propped it up as a votive offering, a small memorial to the end of the season. Even better if it were taken off and stuck there, dooming its partner to the trash bin but becoming the more fitting gesture for saying goodbye. By leaving this fragment behind, you get to take a piece of the place with you. Leave a bit of your heart here, and you can have an inner beach when back in the daily grind. These thoughts make the photograph itself seem less contrived as well: what hints at being posed and a bit too neatly elegiac can be thought of instead as a small and beautiful act of homage. Yesterday John commented on a pile of shoes in Baghdad that looked like they were from a lost and found bin. As he noted, the shoes were the remains of people who had disappeared due to a bombing. What little was present signified how much had been lost. This theme of loss doesn’t haunt every photograph of empty shoes, but it can mark a vanishing summer–and the disappearance of much more as well. You are looking at a photograph of the Barrios de Luna reservoir in Northern Spain. The reservoir, which is dry due to a severe drought, is aptly named for it does look like a moonscape. As above, the image positions the viewer between earth and sky, nature and culture, and, once you’ve read the caption, between water and land, now ironically so. 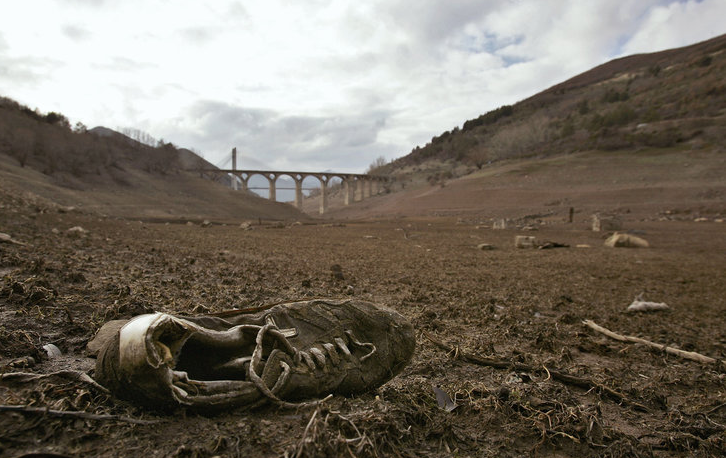 Just as the shoe is missing its owner, the lake bed is missing is reason for being. Again, the lighting and color tone suggest that the good times were in the past. And they were.I can’t help but see the shoe as a track, like a fossilized footprint. It’s as if we are looking back to a prehistoric riverbed, at the traces of a lost species, homo sapiens sapiens, who were not so wise after all. Someone lost a shoe, probably when playing in the water long ago. Now it becomes an accidental memorial, the trace of a vanishing world. Photographs by Josh Kruzich/National Geographic Daily Dozen; Eloy Alonso/Reuters.